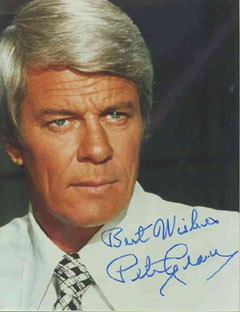 Peter Graves was a familiar face from decades of assorted TV shows, best remembered as the mysterious Jim Phelps, commander of the Impossible Missions Force (IMF) on TV's Mission: Impossible. As a boy growing up in Minnesota, he was Peter Aurness, the younger brother of James Aurness, who grew up to star in Gunsmoke. As a young actor, Graves had roles on old-time TV dramas like The Pepsi-Cola Playhouse, Schlitz Playhouse of Stars, and TV Reader's Digest. His first film was Rogue River in 1951 with Rory Calhoun. In his first starring role, 1952's Red Planet Mars, Graves played a man who thought he was receiving radio messages from Mars, but was actually establishing communication with God. Graves' most famous films include Billy Wilder's Stalag 17, Charles Laughton's The Night of the Hunter, and Roger Corman's It Conquered the World. In his first TV series, The Ray Bolger Show (1953), Graves performed comedy skits and sang and danced. In the western Fury (1955-60), Graves played a widowed rancher who adopted a young orphan boy. Whiplash (1961-62) was another western, with Graves running a stagecoach company. Court Martial was a 1966 military drama. Graves joined Mission: Impossible in 1967 for its second season, replacing the first season's lead, Steven Hill. Hill had played the team leader Mr. Briggs, while Graves played the team leader Mr. Phelps, but the change was never explained to viewers. Mission: Impossible was intelligent, well-written, suspenseful, and successful, and Graves stayed with the show until its cancellation in 1973. He later played the lascivious Captain Oveur in Airplane!. From 1987 to 2001, he was the host of A&E's Biography. In 1988, 15 years after its cancellation, ABC executives revived Mission: Impossible when a writers' strike briefly loomed over Hollywood. The idea was to use scripts from the original series, thus obtaining new programming without violating union rules or breaking the strike. Graves returned as Mr. Phelps, surrounded by a new cast of IMF agents, and four episodes were filmed using scripts from the original series, almost verbatim. These episodes were well received, and the strike was soon settled, allowing production to continue for two seasons, with 35 episodes. Graves should not be confused with the British film actor, Sir Peter Graves (1911-1994), who appeared in many musicals, including Waltz Time, Gaiety George, and Maytime in Mayfair.